Turkish policeman detain a protestor during a protest on Istiklal Avenue in Istanbul (Photo Credit: Behrouz Mehri/AFP/Getty Images). 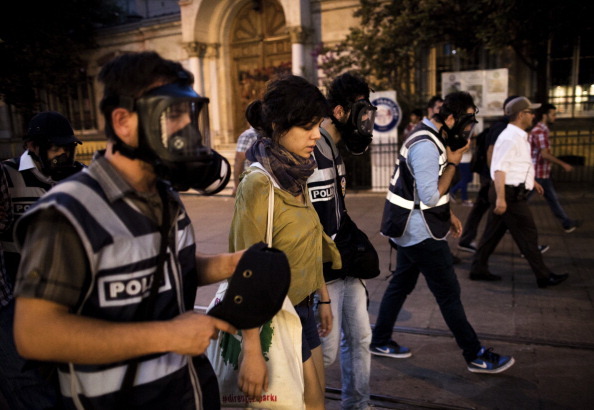 Ugly police violence and repression of freedom of speech and of assembly continue in Turkey, where attempts to stage protests in Taksim Square have been repeatedly suppressed with water cannon, tear gas and rubber bullets in the past few days. 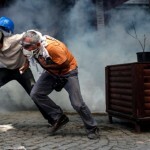 Meanwhile, 19-year-old Ali İsmail Korkmaz succumbed to his wounds this week, the fifth confirmed death in the violence. According to newspaper reports, Korkmaz was injured during protests in Eskişehir on June 2, when he attempted to escape police tear gas and was “brutally beaten by a group wearing civilian clothes.” No arrests have been made in the case. He was nineteen years old. The situation in Turkey is dire and we continue to need your support. Take a minute to add your voice to the hundreds of thousands worldwide who have called on Turkey to protect freedom of expression and end police violence. This entry was posted in Censorship and Free Speech, Europe, Military, Police and Arms and tagged censorship and free speech, Europe, Gezi Park, impunity, Istanbul, Military Police and Arms, Occupy Gezi, petition, police violence, right to organize, Taksim, Turkey, twitter by Howard Eissenstat. Bookmark the permalink. Turkish Crackdown Intensifies: Take Action Today! It is a shame these people have done nothing wrong all they want is freedom of speech and show their love and loyalty to the founder of Turkey Ataturk and their flag. Why is the government abusing them and condemning them for expressing their civil rights. its shame on you that you just think that its only about showing their love to Ataturk. Its not about that. they just protest the government. but they dont want to accept that majority of the turkish people support government. most of the the country hate these provocateur ativists. So the fact that they are "protesting the government" and the "hatred" of the majority against them, as you put it, justify the repression, unchecked violence and even murder by state against these people? No, the shame is on the ones who are deliberately fueling the hatred in my country for political gain. It's very bad when things come to this. I don't think anyone wants children to die. You always have to pass through a storm before you see the light. I don't know why they can't just resolve everything peacefully in the first place. The situation is indeed dire. I honestly didn't think something like this could happen in Turkey. It seemed for a while that they were really evolving.